After helping to defeat the campaign for national Climate Change policy in the US, the Coal Industry is fighting the US government over regulating old, dirty coal fired power plants. New EPA rules would target small and super dirty plants and would retire many coal plants that are on their way out anyway. Energy & Capital gives an argument for investing in coal. This piece shows how investment would happen if there was no government environmental regulation. If left alone, the market would be flush with coal until it literally ran out. I’m glad that the government acts as a check to our endless appetite for easy money. Mazda is unveiling a new engine that has the fuel efficiency of a Prius yet is still 100% petroleum powered. USPS is testing electric vehicles for mail delivery. The UN Biodiversity conference in Japan ends with compromise and some progress. The US is not a part of this Biodiversity agreement, so compromise was possible. A US environmental fugitive is captured in the Dominican Republic. Check it out. Marine Protection Areas (MPA) are areas of earth dedicated to conservation and rehabilitation of the natural environment. 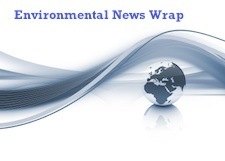 The Environmental News Network brings you this coverage of global MPA’s.